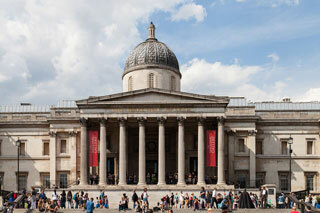 The National Gallery is an art museum founded in 1824, it houses a collection of over 2,300 paintings dating from the mid-13th century to 1900. The Gallery is an exempt charity, and a non-departmental public body of the Department for Culture, Media and Sport. Its collection belongs to the public of the United Kingdom and entry to the main collection is free of charge. It is among the most visited art museums in the world, after the Musée du Louvre, the British Museum, and the Metropolitan Museum of Art. This article uses material from the Wikipedia article " National Gallery", which is released under the Creative Commons Attribution-Share-Alike 3.0 License.